The horrendous Muslim attack at the offices of Charlie Hebdo in Paris that murdered 12 including the Chief editor Stéphane Charbonnier and wounded 11 is a historical event in Europe. 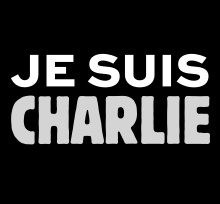 The brave people at Charlie Hebdo, who survived the first Islamic Jihadi fire-bombing attack in November 2011 for drawing cartoons of Prophet Muhammad, refused to submit to Islamic intimidation and threat to their life and decided to stand for freedom. Chief editor Charbonnier then said, “I'm not affraid of retaliation... I would prefer to die standing than living on my knees.” They stood their ground and died—like true martyrs impaled on the swords of Islam—standing tall on their feet in the defense of freedom. "guest editor" for the weekly. Muslim leaders and activists, like in every Jihadi terrorism case, immediately dived into damage-control action denouncing the terrorists and asserting that Islam has nothing to do with this barbaric acts. Hassen Chalghoumi, imam of the Drancy mosque in Paris's Seine-Saint-Denis suburb, spoke with France's BFM TV andcondemned the attackers saying, "These are criminals, barbarians. They have sold their soul to hell. This is not freedom. This is not Islam and I hope the French will come out united at the end of this." "Their barbarism has nothing to do with Islam," he added. "The people who carried out that attack in the name of Islam are not Muslims... The Prophet did not advocate violence against non-Muslims," Abdel Qader Achour, of the conservative Omar Ibn Al Khattab mosque not far from Charlie Hebdo's offices, insisted. But as per the directives of the the Quran, Sunna of Muhammad and Sharia law, this barbarism is perfectly legal and virtuous Islamic act. Let us take a look at Islam's legalization of barbarism. Criticizing or denying any part of the Quran is punishable by death. Criticizing or denying Muhammad is a prophet is punishable by death. Criticizing or denying Allah of Islam is punishable by death. Quran (5:33) - "The punishment of those who wage war against Allah and His messenger and strive to make mischief in the land is only this, that they should be murdered or crucified or their hands and their feet should be cut off on opposite sides or they should be imprisoned; this shall be as a disgrace for them in this world, and in the hereafter they shall have a grievous chastisement"
Quran (8:12) - "I will cast terror into the hearts of those who disbelieve. Therefore strike off their heads and strike off every fingertip of them". No reasonable person would interpret this to mean a spiritual struggle. Muhammad murdered anybody who opposed, challenged his rule or criticized him. What these killers did was follow the Sunna of Muhammad. They enforced Sharia. They avenged prophet Muhammad just as Muhammad did to his opponents. For "showing disaffection," Abu Afak himself became Muhammad's next victim: The apostle said, "Who will deal with this rascal for me?" Whereupon [a follower] went forth and killed him. (Ibn Ishaq/Hisham 995). The murdered 12 kafirs are going to hell for all eternity. It is the will of God. So, despite the media's and Muslim leaders' denial of any link of Islam to these grotesquely barbaric Jihad terrorist massacre of Charlie Hebdo employees, it had everything to do with Islam. This is Real Islam in Action with the only discrepancy that the Charlie Hebdo employees were allowed to live more than 3 years after grievously offending the evil prophet of Islam. This attack was a great victory for Islam and the beginning of the death of Freedom in the land of the free.